My name is Ayanna Molina and I am a Licensed Professional Counselor, a mother of 5 children, an artist and a community organizer. I am the owner and founder of True Love Movement LLC which provides supportive services and mental health/counseling services specifically for the needs of Black people in New Orleans and beyond. My "supreme parenting support" curriculum, Motherhood: The Mothership is back again! In 2012, I offered it to our community and many beautiful things were learned by all who attended (including me!) 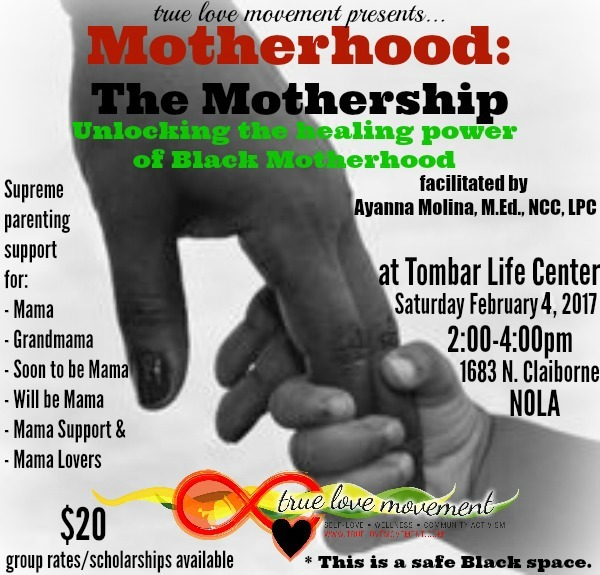 Now streamlined into a 2 hour workshop, Black motherhood is explored and all who attend will leave empowered--fully knowing how awesome the role of Black motherhood is to their own family, their children, our communities, our Nation and our world. All Black Mamas are welcome: Mama, Grandmama, Step-Mama, Soon-to-be-Mama, Will be Mama, Blended Family Mama, Lovers of Mama and Supporters of Mama. This is a Black woman safe space. Black motherhood is a journey. Truthfully, we all know there are some battles that can be difficult to overcome. Stress, worry, depression and overwhelming feelings can debilitate the Black Mama and weaken her natural parenting powers. Motherhood: The Mothership soothes where it hurts, to assist in clearing up any pain associated with parenting. Mothers will leave refreshed, ready and supported. 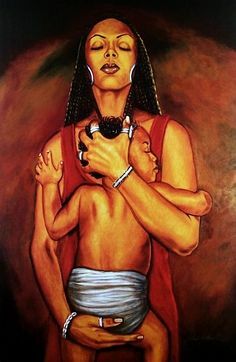 Motherhood: The Mothership is the focused time the Black Mama needs to remember the power of her mighty role. True Love Movement offers many other supportive services which mothers can access if more support is needed after the workshop. If you are unable to come, please spread the word! In communion with the Nation of YHWH, True Love Movement is able to provide the workshop FREE as a part of the Feast of Unleavened Bread. 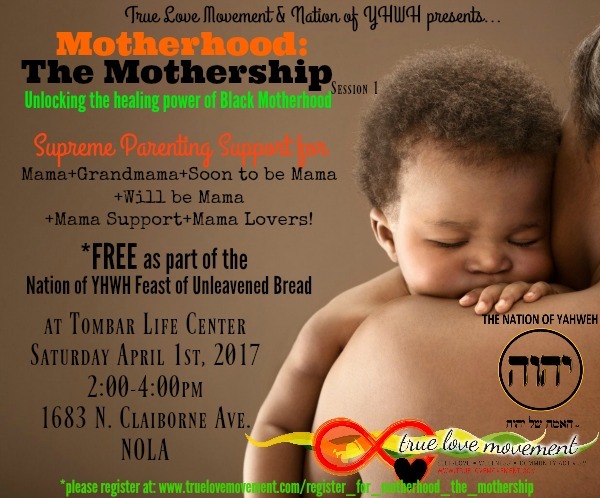 On Saturday, April 1st, 2017 from 2:00 to 4:00, I will facilitate Session 1 (Unlocking the Healing Power of Black Motherhood) again. Session 1 will only be offered one more time before we start our journey through Sessions 2-6 together. Each Session builds on the next so if this journey interests you, please be here. ALL Black Mamas (GrandMamas, Will Be Mamas, Soon to be Mamas, Mama Supporters and Mama Lovers) are welcome to experience the workshop only or stay to experience the rest of the celebrations and other workshops being offered. True Love Movement has partnered with many organizations in the past: churches, community centers, mosques, schools etc. This is how we spread the mission of uplifting and empowering Black people to achieve optimal health and wellness. On Saturday April 1st, 2017 at Tombar Life Center!